“I like to keep this handy for close encounters.” Immortal words from the late Corporal Hicks in the film Aliens. He says this as he removes a short barreled, pistol grip only Ithaca 37 from his shotgun scabbard. 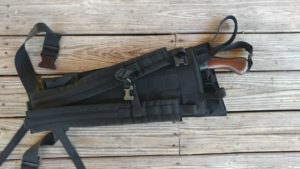 The shotgun scabbard as an idea has seen massive popularity with the release and immediate love of weapons like the Shockwave 590, and the Remington TAC-14. Unfortunately, most of them are cheaply made crap populating the pages of Amazon. The good news is that Beez Combat Systems is making a professional grade shotgun scabbard for both full-size shotguns and short barreled shotguns. The model I am reviewing today is the short barreled scabbard GRID model. Pistol grip only shotguns have traditionally been a very niche weapon, used mostly for breaching. In these roles, its a secondary or even tertiary weapon and it tends to get in the way. Trying to pack a rifle, a handgun, as well as your daily gear on a plate carrier alongside a massive dangling 12 gauge shotgun is not exactly easy. Especially if you are trying to climb, like when boarding a ship, or taking a ladder, etc. 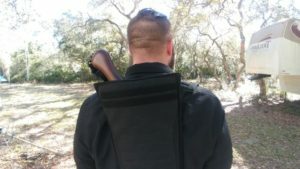 The Beez Combat System Short barrel scabbard makes it easy to tote that extra shotgun around. The short barrel scabbard is available in multiple color options in GRID or standard Molle configuration.